Complete tournament recap included below. New Haven, Mo. 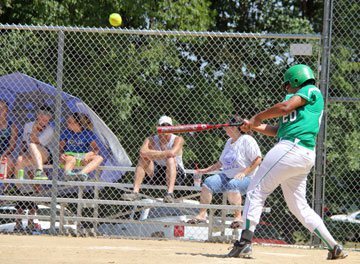 - On the hottest day of the year, with a high of 99 degrees, New Haven began the final inning of the consolation game in Saturday's Softball Classic down 6-4. It was then when their bats ignited, scoring 13 runs off 10 hits in the inning to catch fire and beat Hancock 17-6. Coach Tim Scheer was almost speechless following the game saying, "I can't explain it. I'm not sure what happened in that last inning. They just flat out hit the ball, and I mean hit it hard." There were a lot of things Coach Tim Scheer couldn't explain, like the three home runs that were hit. 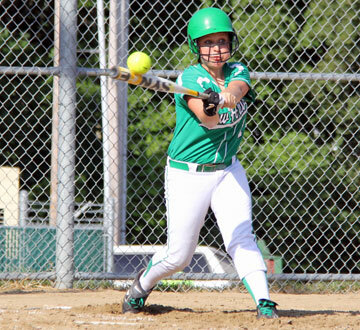 The lady rocks hit as many home runs off Hancock's Kayla McMahon as they did all last year. Stephanie Scheer battles the heat, thrower her third game of the day in which coach Scheer was concerned with the heat and how his pitcher would respond. "I can't say enough about how Stephanie hung in there and battled" said, coach Scheer. Stephanie Scheer, Lindsey Nixon, and Madison Doyle each crushed their first career homers; Doyle's bomb to center field was something "I have been waiting three years for" Coach Tim Scheer said. Trailing 2-1, Meagan Ley knocked a leadoff single in the top of the second bringing Stephanie Scheer to the plate when out of nowhere crushed a two run homer to deep right field off an 0-2 fastball, giving New Haven a 3-2 lead. Hancock came right back in their bottom half of the inning to score four runs. After Scheer gave up two straight walks, New Haven got a break when Hancock was called for runner interference but then went on a two out rally, scoring four runs to take a 6-3 lead. However, that is all they would get as Scheer settled in, throwing three scoreless innings to pick up her second straight win. Having already played two games on the hottest day of the year, New Haven entered the fifth and final inning, as Scheer explained, "We knew it was the last inning down 6-4, we've been out here all day in this heat. The girls could've just laid down and said let’s get this over with." New Haven went into the fifth with the top of their lineup due up. First year player Molly Munsinger led off bunting for a single. New Haven picked up their first out after Tenille Duessler struck out, but the speedy Munsinger stole two bases during the at bat. Madison Doyle strokes her first career home run. Munsinger would score off an RBI single by Carlie Steinbeck and representing the tying run. After Doyle was walked Meagan Ley, already 2-2, hit an RBI single tying it up 6-6. With two on and the go ahead run on second, Stephanie Scheer roped a 0-1 fastball to center field, batting in Doyle to give New Haven a 6-7 lead. Lindsey Nixon dug in the box with one out, two on, and with one swing Nixon hit a three run blast; New Haven's third homer in the game, putting the lady rocks up 10-6. New Haven went on scoring three more runs and was one away from batting through the lineup twice. 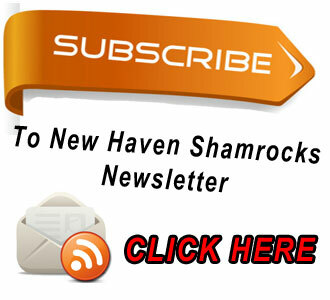 Scheer finished off Hancock to pick up her second straight win as New Haven improves to 2-2 on the year. Ley (pictured left) lit up Hancock with two RBIs and a double on 4-4 hitting while crossing home plate three times. In the three games on Saturday, Ley went a combined 5-7 (.714) accounting for five of New Haven's 27 runs scored on the weekend. The Lady Rocks scored 17 runs off 15 hits while striking out just six times out of a combined 35 plate appearances. 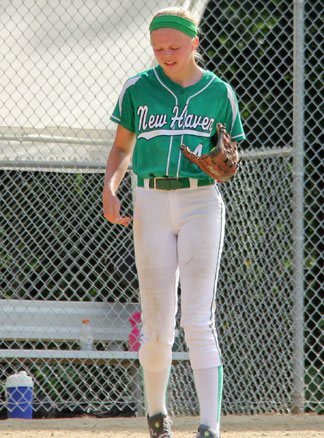 New Haven had each player score at least once; Ley, Munsinger, and Doyle led by each crossing home three times. New Haven also had a combined 12 RBIs, led by Nixon, Doyle, and Scheer each with three. 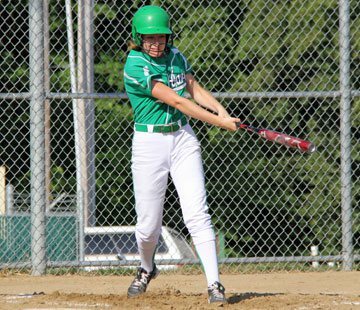 Despite Carlie Steinbeck's 2-2 performance at the plate in Saturday's first game, New Haven loss 8-2 at the hands of Montgomery County. Montgomery County's Corryn got the win, allowing two runs over four innings, while striking out six and surrendering six hits. Montgomery never trailed after scoring four runs in the first on an RBI double by Shelby M and a two-run single by Corryn. One run in the bottom of the second helped New Haven close its deficit to 6-1. An RBI single by Blair Bowers fueled New Haven's comeback but Montgomery stopped the rally after Corryn got Molly Munsinger to strike out and end the inning. Montgomery County would suffer a 3-0 loss to Linn then go on to beat Belle 3-0, winning third place. Shamrocks outlast Bourbon 8-2 advancing into consolation finals. 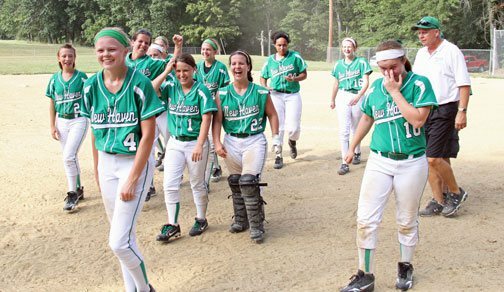 New Haven took down Bourbon 8-2 after slamming them with five runs in the third inning. Tenille Duessler (Pictured right) reached base three times, going 1-1 from the plate, drawing two walks and scoring once. Stephanie Scheer held Bourbon to just one hit while striking out five and walking one. New Haven exploded for five runs in the third led by Blair Bowers RBI single helping the rocks pick up their first win on the season, improving to 1-2. Coach Scheer said, "I can't say enough about the parents... bringing water, gatorade, and just helping keep the girls hydrated throughout the day no doubt contributed to our comback win over Hancock." New Have will have their first road game this evening as they travel to New Bloomfield before returning home to face Cuba on Thursday with a start time of 4:30 p.m. Remember to visit the Sports Zone for schedule downloads and game scores and Like Us on Facebook to view photos from Saturdays Softball Classic.